With all the building that has been going on in and around the Las Vegas, NV /Clark County, NV area over the past twenty years, one thing in common stands out, all of this building started with a concrete contractor pouring a foundation, and without it, there would no building, that’s for sure! Being a Las Vegas, NV /Clark County, NV Concrete Contractor does come with many risks considering that concrete is the foundational building block of almost every building/house that is built these days. There are an endless number of incidents that can happen to even the most careful concrete contractors, so if your company is not insured properly in case of a lawsuit or claim, the consequences could end up costing your company thousands of dollars, or it may even force your company out of business. PJO Insurance Brokerage in Nevada, founded in 2001, has been working with Concrete Companies regarding their insurance needs, helping to create the proper insurance coverage program to fit your particular needs, so if the need should arise, the concrete company will be properly covered. The first step as an owner is to ensure that your Las Vegas/Clark County, NV Concrete company acquires the proper General Liability Insurance Coverage. With the purchase of a General Liability Insurance Policy, you are taking the necessary steps to properly protect your concrete company due to your company’s negligence attributed to your business activities resulting in property damage and/or claims of injury. An added element of General Liability Insurance Coverage is that the policy will provide your company legal defense in the event that a claim or lawsuit is filed against your concrete company. As many of you are aware, Workers’ Compensation Insurance is mandatory in the state of Nevada. By acquiring this particular type of insurance policy, it will provide coverage for your employees for some portion of their lost wages and will cover their medical expenses if they should suffer an injury on the job. To get a better handle on how Worker’s Compensation Insurance Coverage works, think of this coverage as state-regulated, no-fault liability insurance which will cover your employees’ rehabilitation services, medical expenses, or death resulting from a work-related illness or a work-related injury. In addition, regardless of whose fault it is, if your employee becomes injured or suffers an illness in the workplace while performing their job duties, that employee will be eligible for worker’s compensation benefits. Also, in most cases, this type of coverage protects an employer from being sued by an injured worker. The one thing we can always count on is that at some point, given the odds, an unfortunate incident may happen to your company. If your Las Vegas/Clark County, NV Concrete Company were to suffer one of the incidents including a theft, fire, or some similar disastrous action that would qualify as a mishap, would your concrete company be covered for these types of potential disasters? At PJO Insurance Brokerage, we highly recommend to our clients that the proper way to protect such items as your company’s computers, tools, equipment, furniture, fixtures, inventory, and any improvements that may have been made to your rental space or building is to acquire Nevada Property/Inland Marine Insurance Coverage. In addition, some property policies may also include coverage for loss of income due to your business being suspended and unable to operate due to a covered loss and may even cover payroll and operating expenses that would be necessary to keep your company operating after a covered loss. Generally speaking, Property Insurance Policies are designed to protect the assets at your company’s physical address, so if your company will have materials, tools, or equipment that is frequently moved to various locations, acquiring Inland Marine Coverage in addition to Property Insurance would be a smart move. Your Las Vegas/Clark County, NV Concrete company should consider adding other insurance coverages such as Contractors Pollution Liability, Employment Practices Liability, Cyber Liability, Umbrella/Excess Liability Insurance, and Errors and Omissions Insurance, among the various coverages that are available to your company. The experienced brokers at PJO Insurance Brokerage understand how important it is for your Las Vegas/Clark County, NV Concrete Company to have the proper insurance coverage which will be of value in acquiring and retaining your clients due to their peace of mind in knowing that your company is insured in case of an accident that may cause property damage or bodily injury. PJO Insurance Brokerage also understands that the protection of your company is first and foremost and having the proper insurance is an important first step. 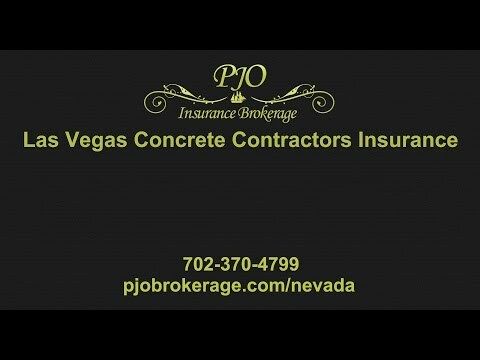 To learn more about just what insurance coverages would be of benefit to your Las Vegas/Clark County, NV Concrete Company, we would welcome you to contact the professional brokers at PJO Insurance Brokerage to discuss all your options and create the proper insurance program for your particular company’s needs.